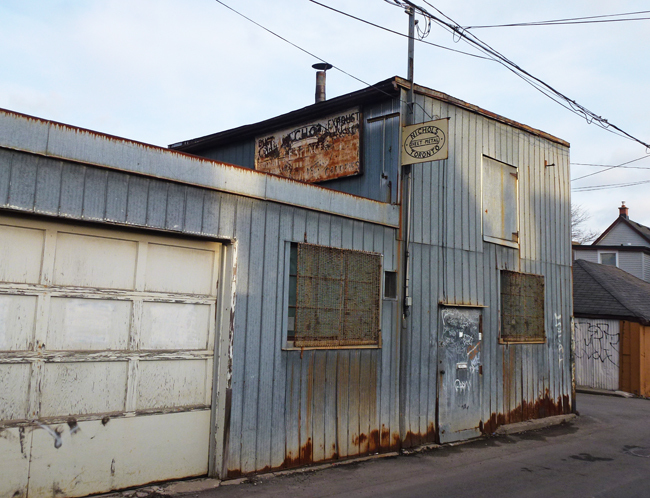 This metal-clad building has survived in a laneway for many years but is now surrounded by houses that sell in the million dollar range so you wonder how long it will be there. I'm not sure if the sheet metal business is still in operation but I can see this space being easily converted to a living space. I love that old rusted sign. You are right, as usual. This cannot stand much longer if it's surrounded by million dollar homes! It appears to need more than just a little TLC. I'd guess at some point it will be bulldozed and another million dollar house will appear in that spot. ...perhaps they will build a high rise here! Why do we love such dear little spots so much? This building gives me little pangs of nostalgia for my old home town. It looks just like something I would see there. Looks like something from the 1950's. I wish I could see what the sign has on it. I would not be unhappy if I owned this property, surrounded by high real estate dwellings. I would bide my time and then sell to the highest bidder. Hope the owner gets a good price when ready to sell. I could see that being converted to studio space. It all looks a little worse for wear. If a developer wants to tear down a solid old bank building, or a 300 year old tree, then I'm sure they wouldn't blink at this one. The building has a story to tell. The rusted sign is pretty neat, wonder what it says. I bet this place has only a little time left before it becomes a memory. Nice find, Pat. You never know it could be someone's workshop inside! This building looks like it could be in my small town. LOVE it! The frayed edges of the city has their own beauty. Great pic. The sign is great and it is interesting that this building has held out against the neighborhood gentrification for so long.